Writing is one of the ways I make sense of my world. As I form sentences and paragraphs, I feel my own comprehension shifting into place. This holds true for an academic article, a reflective essay, or even a personal letter. I find the practice of letter writing is soothing, focusing, and an act of giving. Maybe you do, too. Post-election, I am devastated about the damage to many aspects of American life that I hold dear: inclusion, diversity, equity, and generosity. I treasure the threads in our society that have made it possible for my family and for me to make a good life here: our educational system, our multicultural population, progress in LGBTQ rights, our ever-expanding ideas of what it means to be American. I’m feeling shaken by the divisions that this election has laid bare, and the meanness that has been exposed by the bare-knuckle Trump campaign. Part of me wants to bury my head in books, my writing projects, and my community college teaching. But I came up with a way to move forward: letter writing. I’m not talking about advocacy letters — those will come, too. I’m talking about personal letters to people whose work means a great deal to me, whose example inspires me, whose presence comforts me. I’m writing letters of gratitude to these people, to let them know that their voice is appreciated, their work is noticed, their presence is important — even if the seismic shift in electoral politics seems to say otherwise. Just as I was putting my first notes in the mail, I received one. 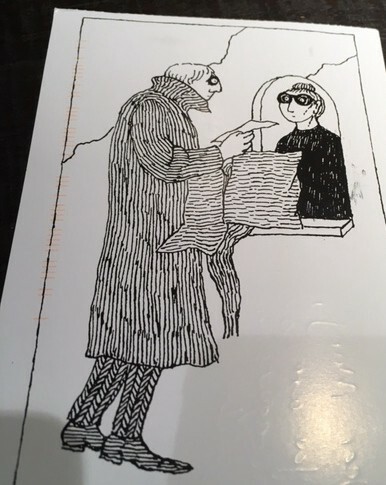 An unsigned postcard, a small message from the universe, urging me onward despite the dread-filled days we find ourselves in. It lifted me up. 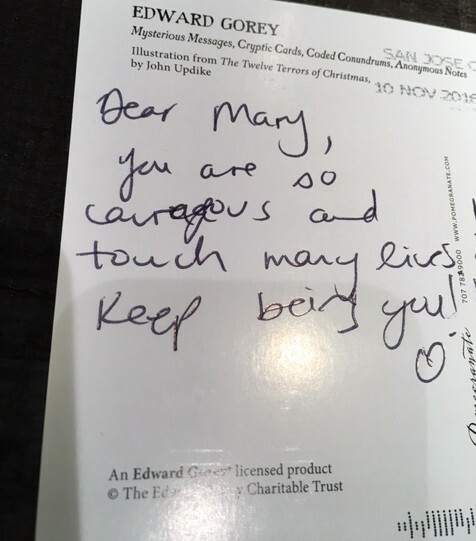 I’m writing to journalists I rely on, to the bookseller who changes lives, to an inspiring teacher, to my favorite authors, and even to Hillary Rodham Clinton herself. The confounding mathematics of the Electoral College did not speak for me. I want to say to these writers and artists and change-makers who I look to: don’t go away. We need you. Will these letters of gratitude make any difference in the noise and heat of these post-election days? Maybe not. But a letter like this just might empower and comfort a voice that is feeling unheard, outnumbered, or ignored. I’m calling it my Gratitude Project. 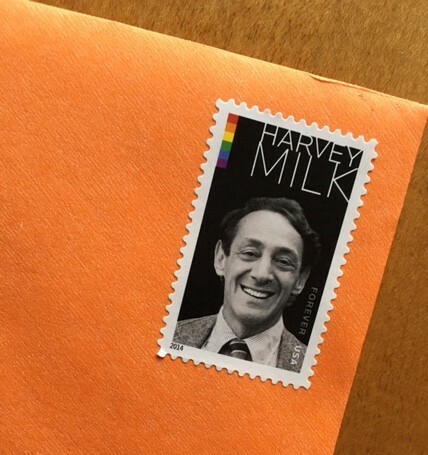 I’m going out to buy more Harvey Milk stamps today. Mary E. Cronin lives on Cape Cod, where she writes for children and teaches at Cape Cod Community College. You can find her on Twitter @maryecronin.